Schizophrenia and bipolar disorder share common genetic underpinnings, Vanderbilt University investigators have discovered. The researchers combined high-resolution gene expression studies that show which genes are turned “on” or “off” with gene association data to reveal signaling pathways linked to schizophrenia and bipolar disorder. The findings, published in Molecular Psychiatry, implicate pathways involving lysosomes, which influence many cellular processes, and actin cytoskeleton remodeling in these psychiatric disorders. The genetic findings mirror long-standing observations that schizophrenia and bipolar disorder share some clinical symptoms. The investigators used whole transcriptome sequencing to evaluate gene expression in post-mortem brain tissue samples from the Stanley Medical Research Institute, one of the largest and most carefully designed brain tissue banks for psychiatric disorders. They identified differentially expressed genes in schizophrenia and bipolar disorder – genes whose expression was different in brain tissue from patients with the disorder compared to control brain tissue. They found that many of the differentially expressed genes were shared between the two disorders. Comparing these genes to previously reported data from large-scale genome-wide association studies (GWAS), the investigators discovered that a subset of the genes were also associated with both schizophrenia and bipolar disorder. “Our study is the first to look at both gene expression and genome-wide association at this scale,” Zhao said. Functional and pathway analyses of the genes identified an interconnected network centered on lysosomal function and regulation of the actin cytoskeleton. The investigators suggested that these pathways may impact synaptic plasticity, neurite outgrowth, axon guidance and other neuronal functions. Importantly, Zhao said, an independent survey of gene expression in samples from the same brain tissue bank validated the current findings. “This project is very unique in its design and analysis, and we are excited about the results,” Zhao said. The importance of lysosomal function and cytoskeletal remodeling to schizophrenia and bipolar disorder suggests new research directions and therapeutic targets, he added. “Obviously we have a long way to go before we can say ‘this is the pathological mechanism in schizophrenia and bipolar disorder,’ but we’re one step closer to that now,” Zhao said. 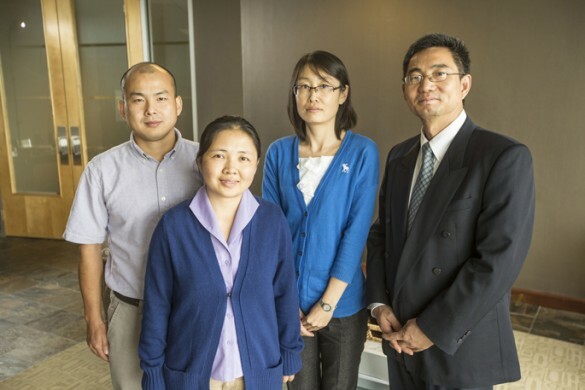 Zhao and his team at Vanderbilt, including Hui Yu, Ph.D., Jingchun Sun, Ph.D., Quan Wang, Ph.D., and Peilin Jia, Ph.D., collaborated with researchers at the Virginia Institute for Psychiatric and Behavioral Genetics, the Beijing Genomics Institute and the Stanley Laboratory of Brain Research. The research was supported by a grant from the National Institutes of Health (LM011177).